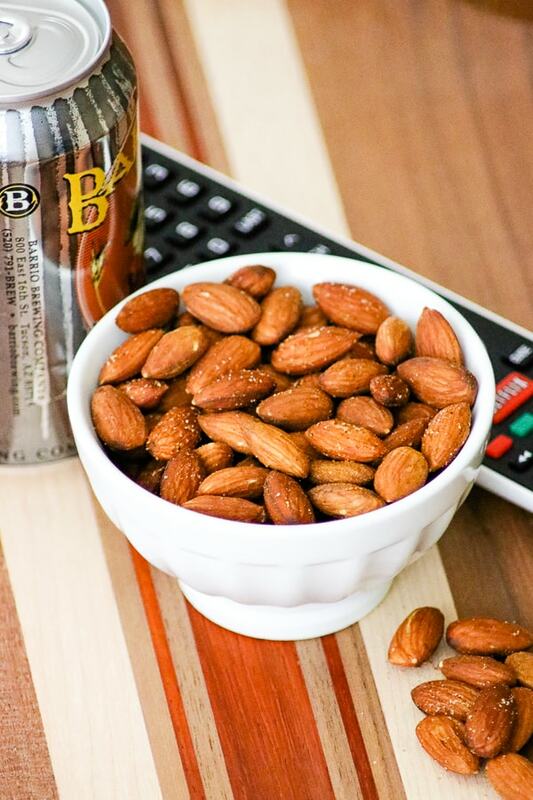 These Baked Spiced Almonds tossed with curry and garlic powder, paprika, salt, and a touch of cayenne are a perfect snack for game day, mid-afternoon or on a hike! Keep the munchies on hand because the hands need something to reach for. 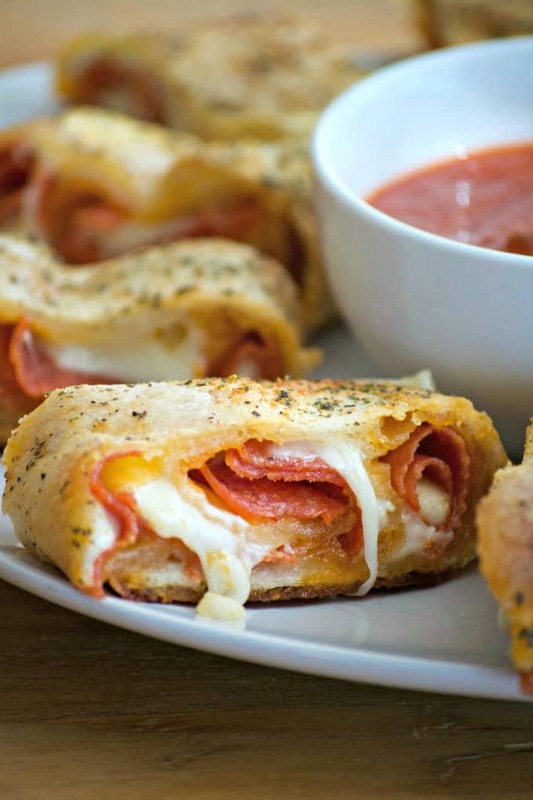 We love to have all sorts of snacks on hand for Game Days, don’t you? Even if it isn’t Game Day it’s still fun to have an assortment of things on hand so I can grab them and snack when I’m working. We also like to take snacks with us when we go on hikes. Even if it isn’t going to be a long one, it’s still nice to have something to munch on just in case hunger strikes. For football games though, I find myself stress eating especially if the game is close or if it’s the playoffs. Please tell me that I’m not alone in this. Red Sox / Yankee games do that to me, and the Patriots in the playoffs. 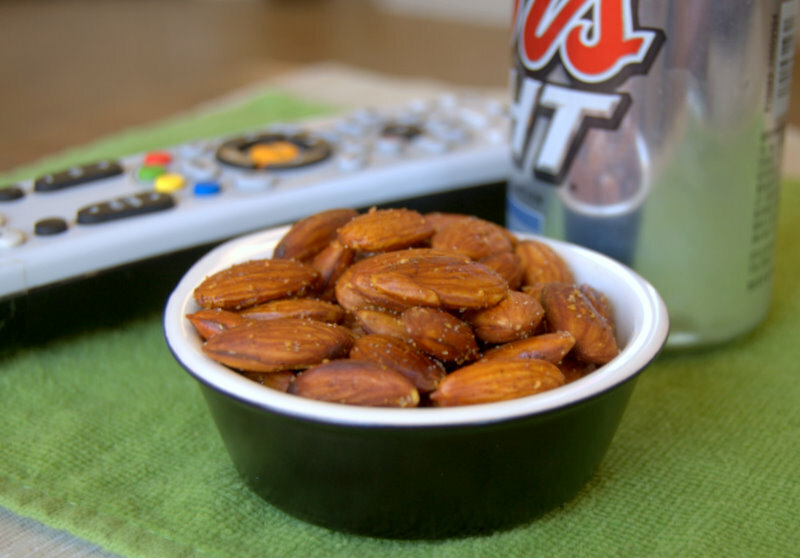 SAVE THESE BAKED SPICED ALMONDS TO YOUR FAVORITE PINTEREST BOARD! Anyway, I made these Baked Spiced Almonds during my original 365 Days of Baking on Day 244, so figured it was time for a post and picture update. I mean, it’s only been what, 7 years? No that puts it into perspective, doesn’t it? 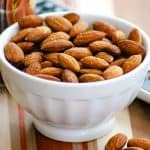 Use raw almonds, not ones that are roasted or salted. You want to be able to control how much salt is added. Line your rimmed baking sheet with parchment paper. 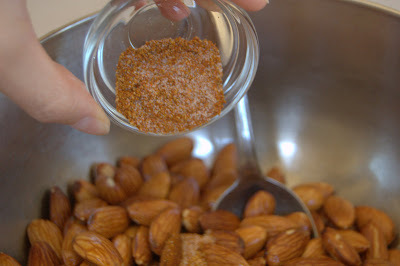 This way you’ll prevent the almonds from sticking and it will help to roast them perfectly. If you like, play around with the seasonings! Substitute some crushed rosemary and thyme for the curry and garlic powders. If you need to store them, place them into a tightly sealed container and use them within a couple of weeks. 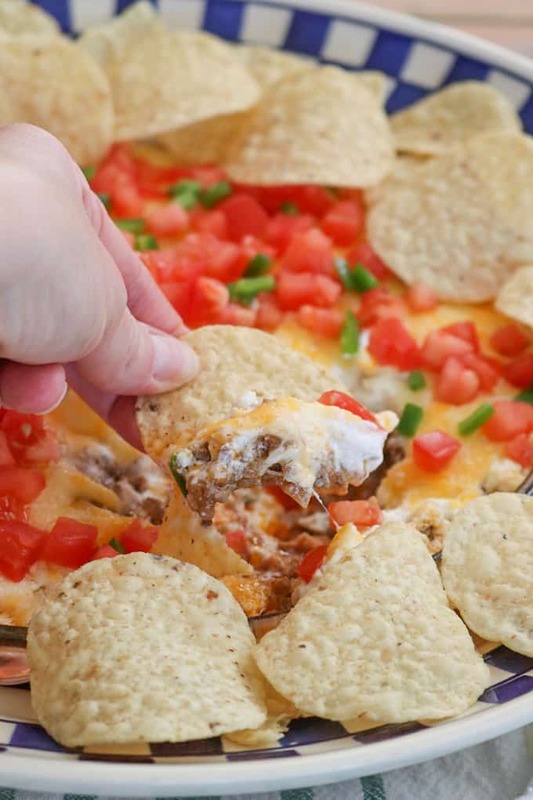 Looking for more snack ideas to have on hand either for the game or just in case, check these out! These Jalapeno Popper Pinwheels from Lisa at Wine & Glue won’t last long when you make them. 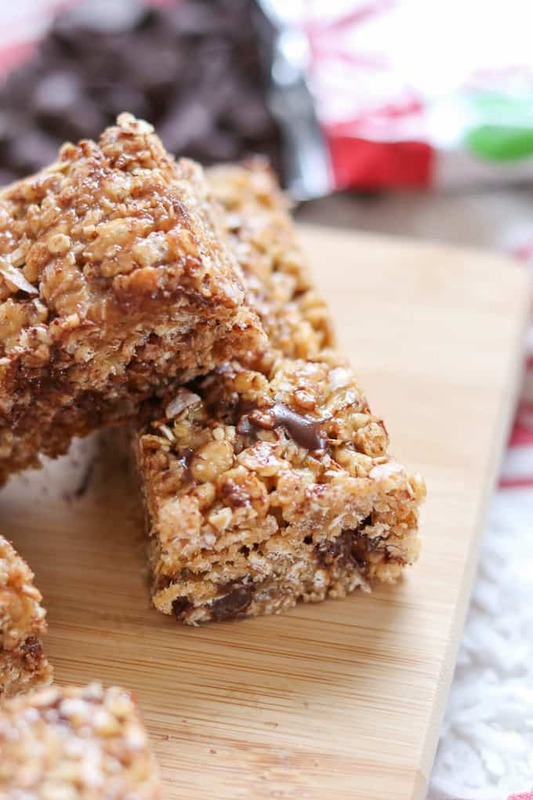 You might want to think about making a double batch! I love munching on nuts (as you can tell from this Baked Spiced Almond recipe!) and I’m eager to make Joanie’s Guinness Glazed Nuts from Zagleft. I think they’ll make a great gift for Christmas, too! If you’re more of a popcorn type person, Reese’s Peanut Butter Cup Popcorn from Maria & Josh at Two Peas & Their Pod has got your name ALL over it! I can’t wait to dig into this stuff myself actually. 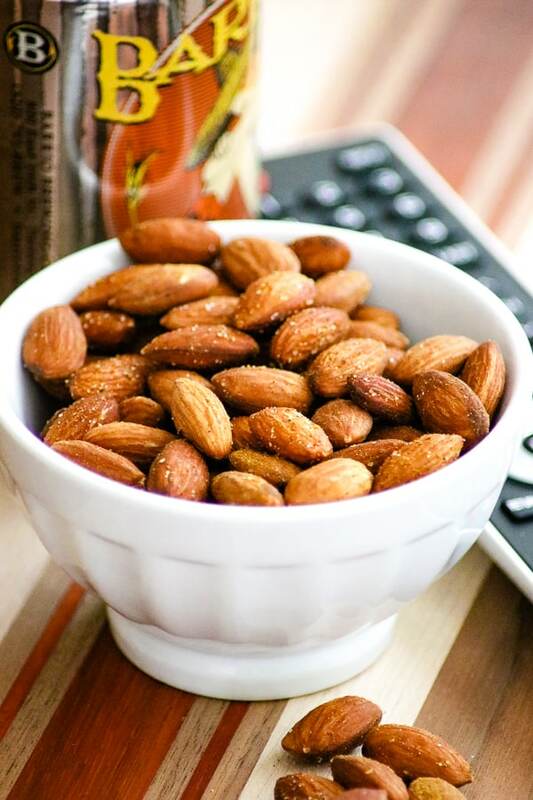 These Baked Spiced Almonds tossed with curry and garlic powder, paprika and a touch of cayenne are a perfect snack for game day, mid-afternoon or on a hike! Preheat oven to 350° F. and prepare a rimmed baking sheet by lining it with a sheet of parchment. 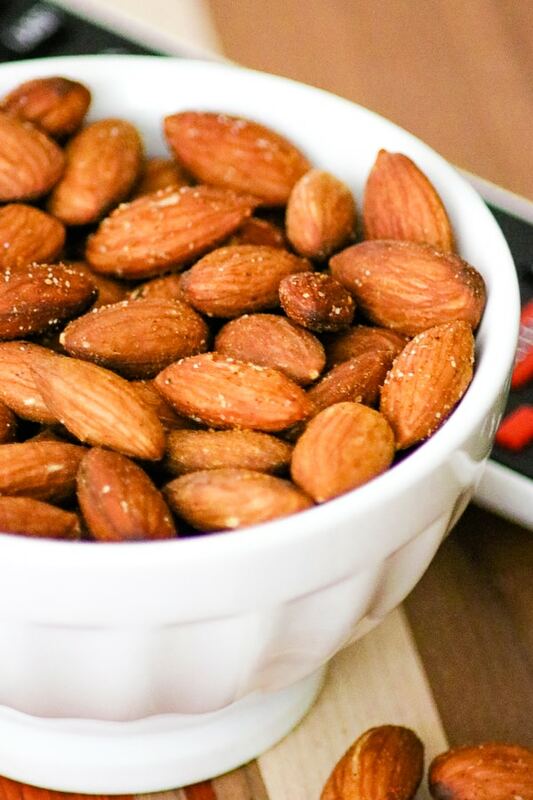 In a medium bowl, mix the almonds with olive oil and toss to completely coat. Spread almonds in a single layer on the prepared baking sheet and bake for 10 minutes. 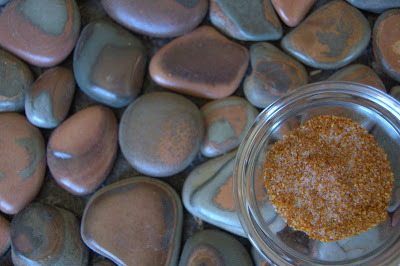 In a small bowl, mix together salt, curry powder, garlic powder, paprika, and cayenne pepper. 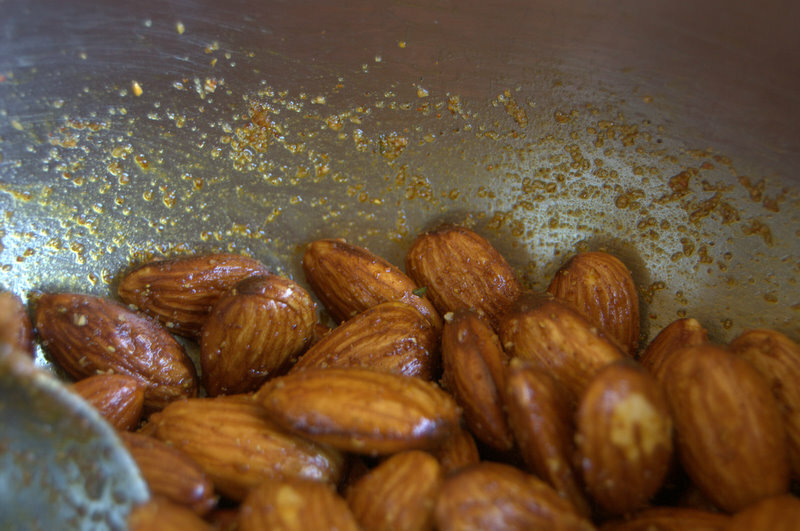 Remove almonds from oven and carefully pour back into the original medium bowl. Add spice mixture to almonds and toss to coat, making sure almonds are evenly covered with spices. 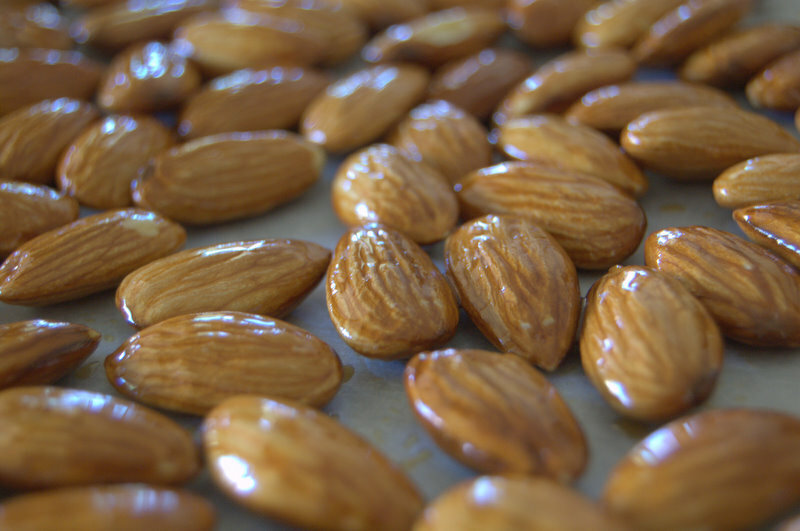 Pour almonds back onto the prepared baking sheet in a single layer, and bake for 5 minutes. In a medium bowl, mix almonds with olive oil and toss to coat completely. Spread almonds in a single layer on prepared sheet and bake for 10 minutes. Pour almonds onto the prepared baking sheet, making a single layer and bake for 5 minutes. When I was writing my original 365 Days of Baking, I rated everything I baked on a scale of 1-4 with 4 being the best and these Baked Spiced Almonds earned 4 rolling pins!! They were quite delicious and were a HUGE hit with Mr. 365!! And, they are strangely addicting. I don’t know why I said strangely, it just sounded like a good word to use. At first you taste the curry, salt and garlic, but then as you chew, the spiciness kicks in. They aren’t too spicy because I made them to my liking and I don’t eat things that are too spicy. Of course, if you want more of a kick, then add 1/4 more teaspoon of the cayenne pepper. Or more even, if you’re that brave! 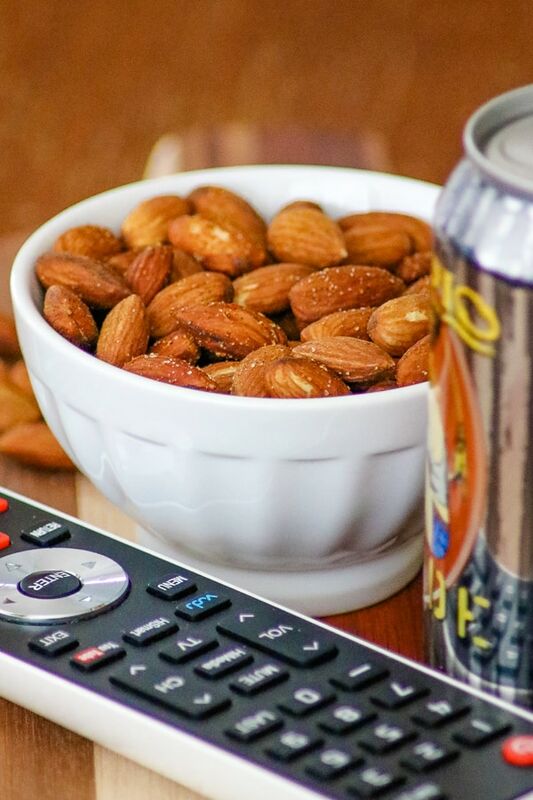 These will make great Game Day munchies parked next to the remote or a nice treat to put out when you’re having company over for the holidays, so go buy some almonds in bulk. You’ll save some money that way, too. 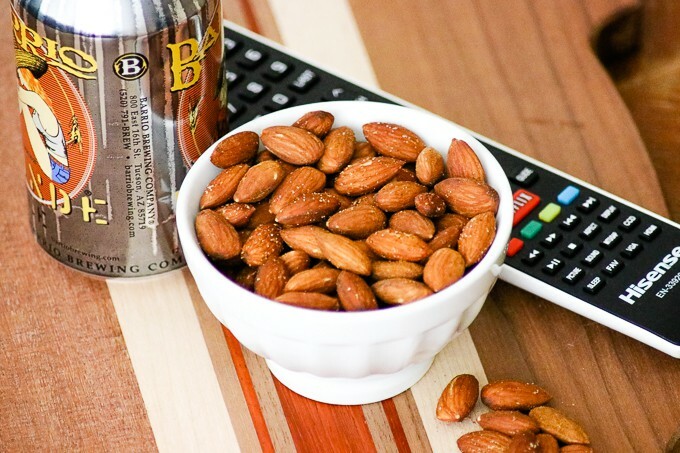 If you like these Baked Spiced Almonds, take a look at these other popular snacks on the blog! This post was originally published Oct. 22, ’11 and has been updated with pictures and in format on Jan. 31, ’19. 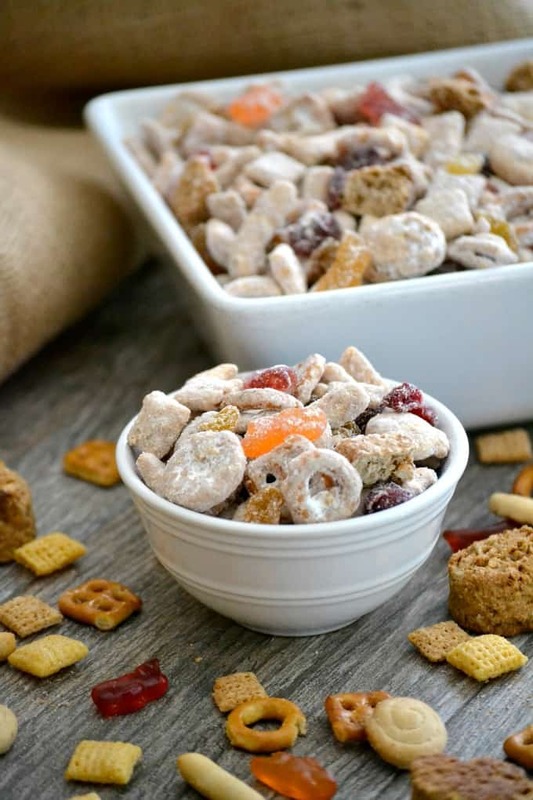 Going to give this a try with pecans, great snack for the hubby! trying…jumped ahead and just mixed almonds with oil and spices then baked for ten.